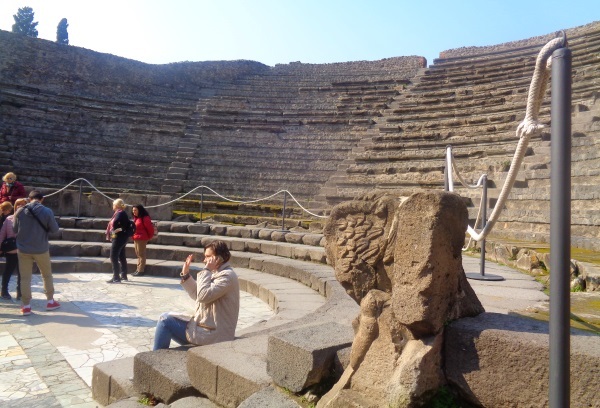 One of the most important and most visited tourist attractions in Pompeii are the large theatres. In total there are three theatres: The Amphitheatre, the Great Pompeii Theatre and the Small Pompeii Theatre, also called Odeion. 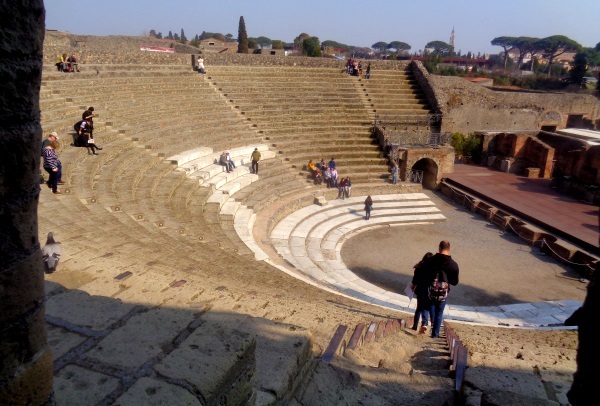 The big theatre and the small theatre are located next to each other in the south of the ancient city of Pompeii, the amphitheatre is located in the southeast, about one kilometre from the centre (Forum). Since in ancient times there was no cinema, television and Internet, people often went to theaters. The main performances were tragedies and comedies, in the amphitheatre of Pompeii but also competitions and bloody fighting games of gladiators. Other recreational facilities were, as in modern times, pubs and restaurants and brothels. Life in Roman antiquity was no different than it is today. 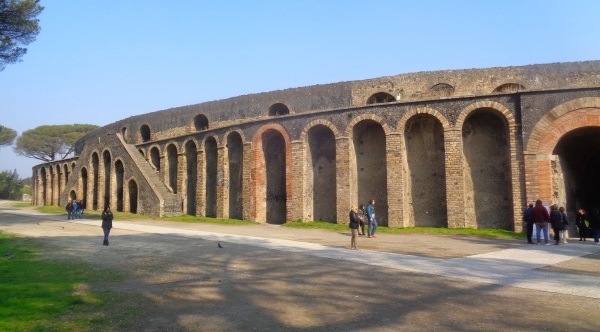 The amphitheatre is located in the east of the former Roman city of Pompeii. It was built about 75 B.C. and was one of the first amphitheatres ever built by the Romans. The seats were divided into seats for important personalities, grandstands for men and extra seats for women. It’s a big arena, actually a stadium. In the amphitheatre of Pompeii less theatre was played. Much more there were hard fights between gladiators and also with animals. Other, less bloody performances were similar to today’s circus or sports competitions. Like everything in Pompeii, the amphitheatre was buried many meters high during the volcanic eruption in August 79 AD. The huge building, the largest building in Pompeii at that time, was partly excavated again in the 18th century. It is very well preserved. So good that today again in the over 2000 year old theatre there are events like rock concerts. In the antiquity a roof made of fabric (canopy) was stretched over the arena under strong sun. The rings for the fastening of the light roof can still be seen today. Also performances of sea battles and the like were possible, as in the Colosseum in Rome, in the amphitheatre of Pompeii. For this purpose the interior was flooded. There is no record of the maximum number of spectators in the Pompeii amphitheatre in ancient times. Some assume 12.000 people, others 20.000. That means in any case that half the city including slaves found place in the ancient stadium. Performances were very popular in ancient Rome. Especially the bloody fights between gladiators and humans against animals attracted the spectators. The amphitheatre in Pompeii was probably one of the first large theatres of its kind in the Roman Empire. During the construction, mistakes were made due to inexperience, experts found many improvements. The venue was built around 80 to 70 B.C. In 59 B.C., after a major dispute among the audience, fighting performances in the Pompeii amphitheatre were banned for 10 years. During this time a great earthquake occurred (63 A.D.), which severely damaged the building. After the reconstruction in 79 A.D., the volcano Vesuvius erupted and the building was totally destroyed. Until the excavation in modern times, the amphitheatre, like everything else in Pompeii, lay under a metre-high layer of ash. After the excavation it is today the best preserved Roman amphitheatre. The word „Amphi“ means all around (Greek). So an amphitheatre is an „all-around theatre“ and model for the modern sports stadiums of today. The great theatre is located in the south of the ancient excavation Pompeii. It could hold about 5000 spectators, who sat in a semicircle, below was the stage. On the big stage the actors of antiquity played plays. The theatre was often very well attended in antiquity. It existed about 300 years, from the 2nd century BC until the eruption of Vesuvius in 79 AD. Among other things, tragedies and comedies were performed in ancient times, accompanied by dance and music. Political meetings were also held occasionally at the Pompeii Great Theatre. Between the plays and in the breaks there were stands with food and drinks, just like in a theatre today. Also the big theatre can be visited and is one of the highlights for many visitors in Pompeii. It is also well preserved. In contrast to the two large open-air theatres, the Kleine Theater had a roof. This was necessary because it was mainly for musical performances. Music without electric amplifiers in theatres without a roof is very difficult. The roof is no longer there today. The Odeon, as the Little Theatre Pompeii is also called, is right next to the Great Theatre. Besides music it also has poems and theatre. The small theatre had room for about 1000 spectators. The acoustics were probably very good.